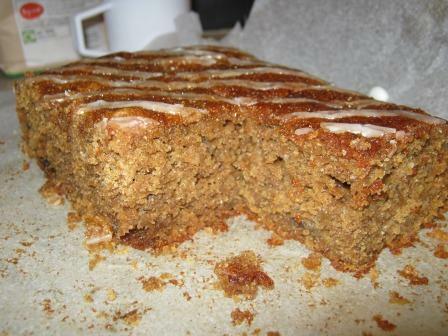 ginger cake | what? bread? Bank Holiday weekend has come and gone and I’ve not been tied to the kitchen baking all weekend, although I have made cake, more flakey butter buns, pizza and have a couple of loaves in the oven while I’m writing this. So, first up is the cake. Dan Lepard’s dark banana ginger cake from The Guardian Weekend magazine 28 April 2012 . It’s the second recipe on that page. Things have to sit around my house sometimes before I get around to baking them. However, I do habitually freeze leftover bananas when they’ve gone too far to eat and I happened to have a selection in the freezer so thought it was time to do something useful with them. This recipe couldn’t be easier, apart from getting frost bitten fingers while I was trying to peel partially defrosted bananas to make up the weight required. You need dark muscovado sugar, or caster sugar and black treacle, because that’s all dark muscovado sugar is really, squidgy ripe bananas, sunflower oil, eggs, chopped glace ginger, wholemeal bread flour and baking powder. I only had large eggs so used 3 not the 4 medium suggested in the recipe. As the mix was pretty sloppy at that point I didn’t add the fourth egg. I used my oven on fan setting and got a lovely even rise that baked in the time suggested. Result! I topped it off with some streaks of water icing made with lemon juice. The cake is very moist and could possibly have taken a few more minutes of baking but I’m happy with that. 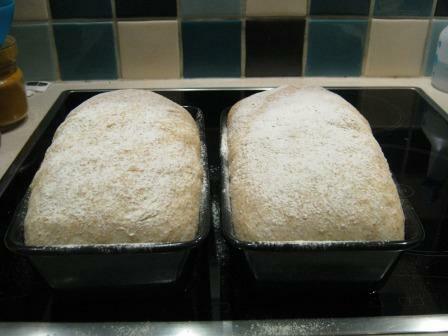 Because the flour is wholemeal it is also quite crumbly, but that’s OK too. And as most of it’s gone, this is what it looks like now. Breadandbikes asked me what breads I like to make for packed lunch sandwiches. As I prefer to have some wholemeal in my loaves at least once a week I make a 50:50 wholemeal and white loaf and I make two of them at a time. I use the wholemeal loaf recipe from Dan Lepard’s Short and Sweet as a base and use half as wholemeal and half as white bread flour. I only put in one lot of vitamin C as I suppose the white flour can manage on its own. I also don’t use melted butter as the recipe suggests, but put in oil, usually sunflower oil, instead. So we have: fresh yeast, brown sugar and I don’t always put in the amount suggested – it depends on how much time I have and how cold the kitchen is, vitamin C, wholemeal and white bread flour, salt and oil. Different wholemeal flours give different results as do different proportions of white to wholemeal, but I think on balance it is easiest to remember 50:50! Having spent my annual bonus on Shipton’s mill, today I am using their organic wholewheat flour and some supermarket white. https://whatbread.wordpress.com/2012/04/03/heritage-flour-and-sour-cream-bread/ and as you can see, makes nice big loaves that rise. 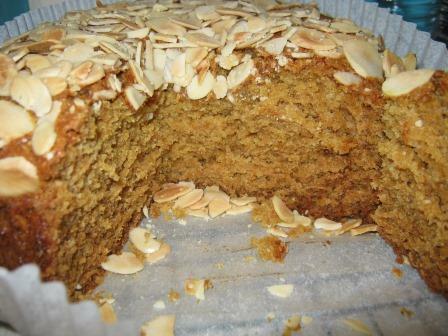 Lots of other bakers seem to like this as it gives a very satisfactory outcome! And finally, and I don’t have any pictures of these as yet, is Dan’s white farmhouse tin loaf, again from Short and Sweet. This uses the sponge method so I start it in the morning and bake it when I get home from school. The recipe uses yeast, white flour, salt and butter, again I usually use oil because it is quicker. The recipe in Short and Sweet is for 350g of flour per loaf. I usually double up and make two, but I am going to try a triple up and split it into two because that doesn’t really give big enough pieces. And finally a word on baking tins. 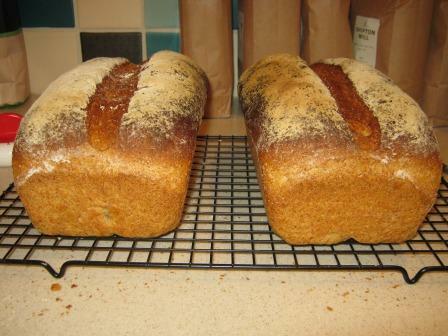 I use 2lb loaf tins bought from Sainsbury’s which are quite heavy duty. I have tried a silicone one and find that the loaves just push the sides out, so a good stiff tin is essential. Interestingly, I have read that the Carbon Trust is trying to get commercial bakers to use lighter weight loaf tins because they use less energy to heat them up than the heavy duty ones they currently use. I wonder if the result will be the same?